Comma Separated Values (CSV) - Plain text files that contain a comma after each entry. CSV files can generally be imported into any spreadsheet file or database regardless of the type of software or computer you are using. Portable Document Format (PDF) - PDF is the standard for the exchange of documents across different formats. When a report has Search fields in the column headers, you'll be offered options after clicking the Export button. 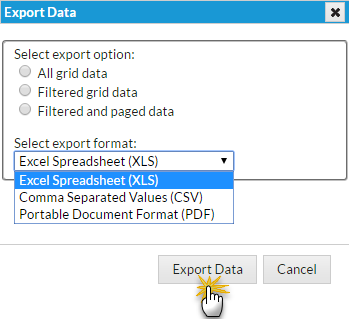 All grid data exports the entire report (all pages, all data) regardless of whether you have used a Search field. Filtered grid data exports only the results displayed after using a Search field. Filtered and paged data exports only the page you are viewing (assuming there are multiple pages of data) as well as the results displayed after using a Search field. Select the export format in the Export Data pop-up box. The ability to export information is controlled by the Export Grid Information user permission located in the General category.